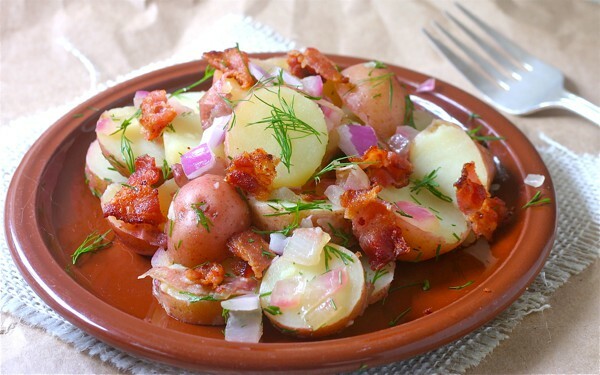 This Pennsylvania Dutch warm potato salad is a popular “side” where I grew up, in the heart of Pennsylvania Dutch country, in Lebanon County. What is distinctive about this potato salad is that it uses no mayo and is served right after the potatoes have been cooked, so it is warm when served. I lost my Dad over twenty years ago, and I always think of him when I make this dish, usually during summer. It was a favorite dish of his, along with “red beet” eggs and birch beer, his other “Dutch” favorites. A native New Yorker, he became accustomed to Pennsylvania Dutch culture more easily than did my mother, although she came to embrace it in her cooking. I love to feature my mother’s Pennsylvania Dutch recipes in my blog. She would get such a kick out of this. I substituted apple cider vinegar, preferring its milder snap to the traditional red wine vinegar. Chicken stock gives a lighter flavor to the dish, although beef broth is the classic ‘Dutch’ ingredient. Fresh dill is my favorite herb to pair with any potato salad, but parsley would work as well, as would a handful of chopped celery. 1. In a large saucepan, barely cover potatoes with cold water, bring to a boil, then cook until just tender, about 15 minutes. 2. Drain the potatoes and, using a knife and fork, cut them into thick slices and place in a non-reactive bowl. Add the stock, salt and pepper and 3 tablespoons of the vinegar. Cover the potatoes to keep them warm. 3. While the potatoes are absorbing the stock and vinegar, heat the oil in a large skillet and fry the bacon until brown and crispy. Drain on paper towels. 4. With the oil/bacon fat still on medium heat, saute the onion until softened, about 3 minutes. Add the brown sugar and stir for another minute. 5. Add the onions to the potatoes, along with the remaining 3 tablespoons of vinegar. Roughly chop the bacon and add to the salad. Correct seasoning – it will need more salt. Toss in the fresh dill and mix well. 6. Allow the salad to “rest”, covered, a few minutes for the flavors to come together. Garnish with more fresh dill and serve while warm. What a beautiful potato salad! I’d prefer this than those potato salads swimming in mayonnaise! Thanks, Laura – it was a family favorite that I grew up with – still make it, of course. Thanks, Laura, I frequently substitute crisp celery for the bacon to relieve my conscience. Perfect timing for this posting. We have one set of kids and grandkids arriving tomorrow, and more grandkids arriving next Friday. This would be perfect for them! (And for me). I’d prefer the apple cider vinegar too. And it’s another beautiful photo, Liz. Have a wonderful adventure in Alaska. Can’t wait to hear about it! Have fun with the grandkids – and thanks for your “2 cents” yesterday – putting it to use. I love this salad, its my go to potato salad since trying it when you first posted it! I printed it off and that page is so dog-eared and splattered now! Great recipe Liz. I remember how pleased you were, Jayne, when your husband gave this a thumbs up. I just love you Pennsylvania Dutch Warm Potato Salad, I can almost taste it. Hope you have a great week and thanks for sharing! This sounds wonderful. I love that there is no mayo and the addition of dill sounds delicious. It is a great recipe – cut back on the salty ingredients, as a new Mom, and bacon is just a PA Dutch ingredient. I make it without bacon, more often than not. This is one of those recipes I have yet to master and yet I LOVE potato salad! I typically just get it from the grocery store 🙂 You’ve inspired me to try it at home once again. I’m making it over the weekend – don’t forget the bacon! My mom used to make a killer potato salad in Germany. Your recipe looks similar to hers. I really prefer the vinaigrette to mayo – sometimes I omit the bacon. Liz that potato salad is wonderful, love anything with bacon, really like the vinegar rather than mayo in this. Thanks, Suzanne – I tend to add more mustard to the vinaigrette these days. Love to you and Nando. I have been craving potato salads lately. Now I am craving this one! No doubt you will add your special touch to my recipe, Lynda – enjoy the holiday! I love dishes like this. My family is from up state New York in the Binghamtom area and although I remember a lot of Polish and Italian food I also remember food like this. Mmmm. Soooo good. Thanks for sharing! I have never made homemade potato salad before but I do like how healthy this one is without mayo. Pinned for later! It’s very easy to make – sometimes I leave out the bacon for an even healthier version. Liz, I’m adding this recipe to our fried chicken & grayhound cocktail dinner party!